Make sure your dog has all the right tags. Losing your dog on your trip does NOT make for good holiday memories. Consider getting a microchip, a tiny chip that is implanted into your dog by way of an injection. If your dog is found, she can be taken to just about any vet, and they can scan the chip and locate her for you. Don’t forget to bring the necessities: leash, food, water bowl, dog bed, doggie bags, crate, dog bed, any medications and a few toys. You want your dog to have fun and be comfortable too. That’s the whole point right? By air? By Car? Although I don’t suggest flying with your dog, it can be done. Some airlines will allow you to bring your pet on the plane with you if the crate is small enough to fit under the seat. Otherwise, dogs are considered “cargo” (how rude!) and stored accordingly. If you are planning on traveling by car, just make sure your dog is accustomed to the car. If your dog has anxiety in the car, traveling with her may not be a good idea. Gotta’ love trends. Dogs have become so popular that there are a large number of hotels that will put your canine friend up for the night. Some hotels even have a doggy room service menu, turndown service and/or doggie day care. Make sure to get the specifics on what they offer. Also, make sure you find out what the fees are. 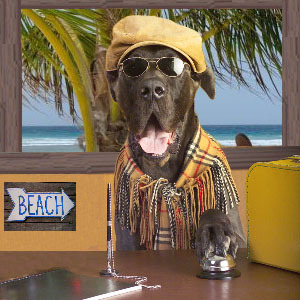 Sometimes there is an initial “deposit” as well as a daily fee for your pet lodging. In the same way you prepare yourself for any medical emergency on the road, prepare your dog too. Bring medical records with you and a list of veterinary services in the area. You and your dog can have a fantastic summer holiday. Just make sure to be prepared and get ready for a great family weekend!